Michigan Expats: Michigan Lighthouse on Bing! Say what you want about the Bing search engine, but I might use it a little more now that they are featuring a beautiful Michigan Lighthouse. You have to get to it today before they change the image. Check out more details regarding the Wawatam Lighhouse in St. Ignace here below. 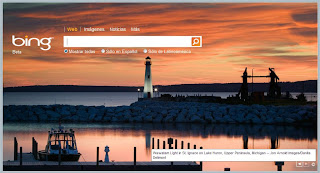 The dazzling landmarks on the search engine page by Bing is one of the futures that I admire most. Never fails to take my breath away.